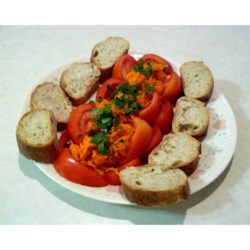 "This carrot salad is a standard appetizer and snack in France. As it's made with a tangy vinaigrette, it's comparable to an American coleslaw." In a medium bowl, whisk together the mustard, olive oil, salt and pepper. Add the shredded carrots, and mix until coated. Refrigerate for at least 2 hours before serving. Very good -- I also like to add lots of chopped parsley. I agree with the reviewer who said it needs some lemon juice. Wow! who would have thought that this combination would taste so good! It does make a lot of salad.. Tasted like France... I liked it even better after I added some fresh lemon juice. PS - 10 carrots make a lot of salad! This is exactly how I remember it. I immigrated from France at the age of 12 and defenetly miss alot of receipes from there.